In 1835, 181 years ago, Steward’s ancestors worked as slaves at Wavering Place Plantation when it was a cotton plantation, in South Carolina. Back then, plantation owner Joel Robert Adams and one of his slaves, Sarah Jones Adams, had a daughter, Louisa. Louisa had Octavia. Octavia had James. James had JD. And JD had Steward’s mother Linda, Steward wrote on a blog post. Steward, who is from Canton, Michigan, is a self-described history buff. He submitted his DNA to Ancestry.com and discovered the connection to Wavering Place Plantation. He also discovered that he and Robert Adams, the present plantation owner, are cousins. 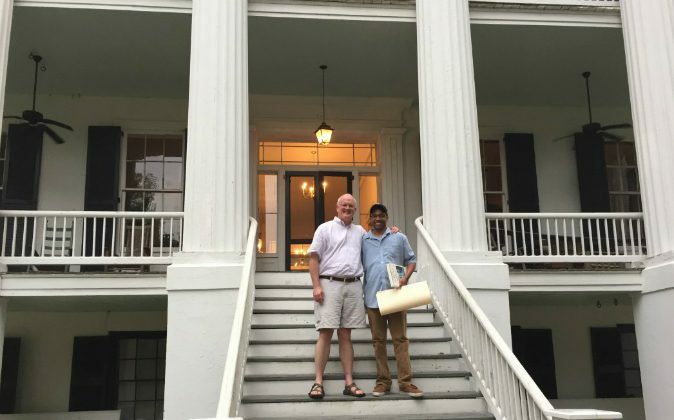 “And now 181 years later, after almost two centuries, my mother and father, my two sons, my wife, and myself sat down in that very house and broke bread with the descendant of those who owned members of my family,” Steward, 44, wrote about a special dinner on July 3. The families talked for three hours over dinner, Steward said. They touched base on some historical information, “but we didn’t spend a lot of time about the descendant of a slave owner or a slave descendant,” he said. However, they did spend a significant amount of time talking about the Game of Thrones. Adams and his wife are huge fans—just like him, Steward said. Last year, Steward’s mother Linda stopped by the plantation and told Shana, Adam’s wife, about their connection. Both families were equally excited, and the Adams family gave Steward’s parents a tour around the house. Steward and Adams have been speaking over the phone since and also connected on Facebook. Adam wanted Steward, who lives in Detroit, Michigan, to visit South Carolina and see the plantation for himself. Steward grabbed the opportunity when he visited his ill grandmother in South Carolina earlier this month. At first, Steward said he was going to visit the house with just his wife, but the Adams family insisted he bring everyone along with him—including his wife, two sons, and parents. They gave Steward and his family a tour around the plantation house, and he noticed that inside the home, there was a shack in the back, which he assumed was where his family used to live, for they were house slaves, he said. Steward said he saw just about everything, except for the slave cemetery, which the Adams didn’t even know they had. “I would have paid my respects,” Steward said, adding it to the list of things to do next time. Many people took issue with Steward meeting with the people whose descendents “owned” his family. He said people found it a bit odd. But Steward said Wavering Place Plantation—family owned since 1766—was much deeper than that to him. However, he said the experience would have been different if he actually knew those family members. “It would have been even more emotional,” he said. Steward, who has been doing genealogy for his family for about 20 years, said he is happy that he and Adams befriended one another. “We allow labels to stop us from getting to know someone,” he said. He also hopes that anyone who reads his story is inspired to get to know people as individuals. “Labels dictate what kind of relationship you have with people—get to know people so you won’t make a decision based off of labels,” he said.